Motorcycling is a gift sent to us by the Great Manufacturer (easy, HD fans, as I am not referencing that Wisconsin maker…) in the ether and as riders we have a responsibility to cherish our moments with the sticky side down. With that being said, when do you check your tire pressures? I happen to check mine before the start to every ride because my brain wouldn’t stop focusing on the fact that I didn’t and I wouldn’t be able to enjoy my ride. In fact, it is only one of the items on my multi-point preflight checklist. I have had the joy of wearing out a Bridgestone BT-016 recently and slapped another bun on the rim before going out on my next adventure. Last week I went for about a twenty mile errand and on the way home I had a little squirm at a corner exit but just chalked it up to the tire not being worn in yet. 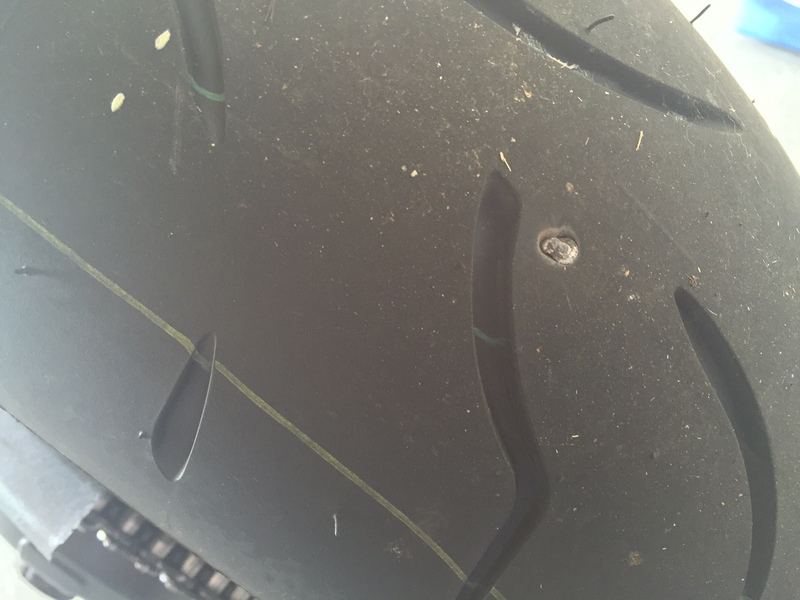 Before my next ride a couple days ago I checked the air pressure and it was a crappy 30psi in the rear tire. Obviously a couple pounds of fluctuation due to weather conditions is normal but twelve pounds?! I started grumbling to myself as I inflated the tire because I knew what the issue was. I didn’t have to roll my bike backwards but half a tire rotation until I saw Big Ugly. Thankfully I had a fresh set of Bridgestone S20 EVOs sitting in the garage. As quickly as I could (thanks, single side swingarm!) I popped both rims off the Speed and took them up to the bike shop. One half hour later I was on my way home with fresh rubber and re-installed the rims. Moral of the story? 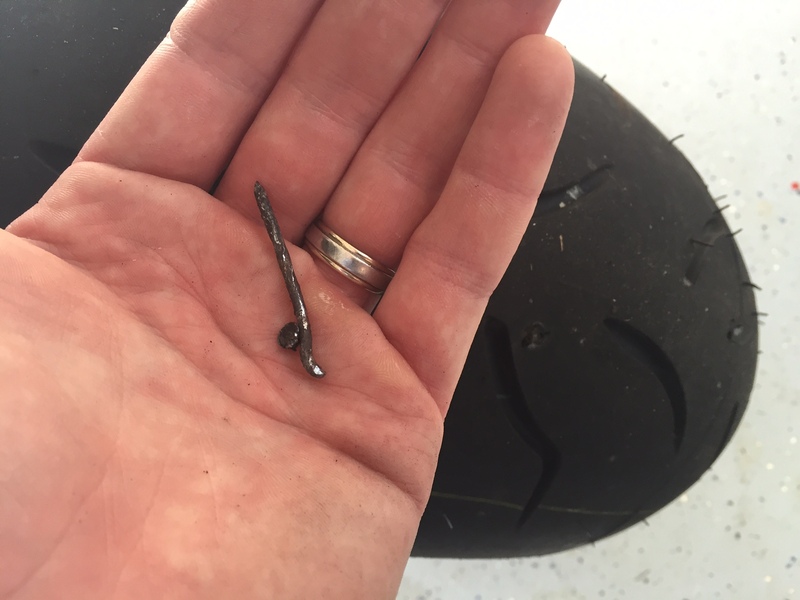 Picking up a nail in a brand new tire is a big ol’ stick in your eye but it is far better than dying. So there’s that. Oh, and check your tire pressures often!